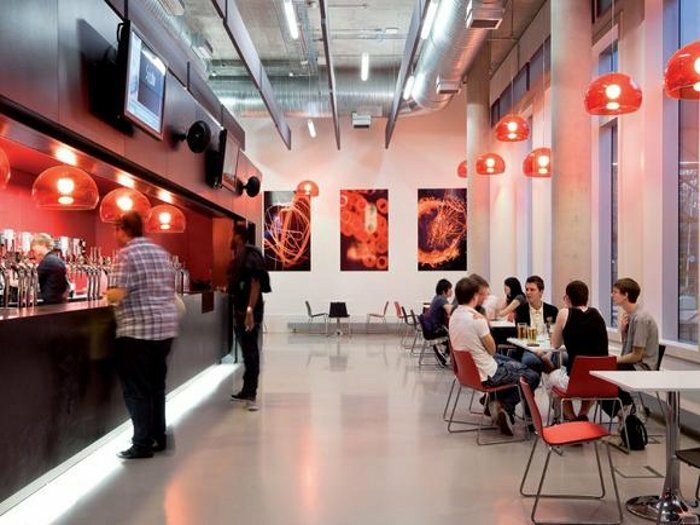 With fees on the rise, resulting in a more cost-driven, even more responsible, attitude to alcohol setting in among the younger generation, the student experience has evolved over the past few years, and it seems that students have come to expect more from their student union building than a scruffy hall serving cheap beer. Brown ought to have a pretty good idea of what students are looking for. His practice has designed buildings for universities and schools all over the country. 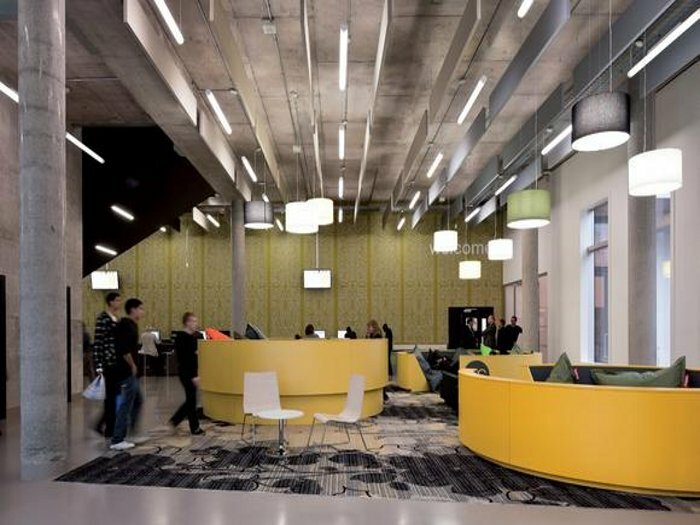 In fact, the practice’s knowledge and experience actually helped drive the project beyond the standard bar model of a student union. ‘The idea of the project started out as more of a student union in the conventional sense – a bar and venue with some learning space – but we developed the idea of a sort of living room for the whole university,’ says Brown. According to Brown, another motivating factor was that many of the students attending Coventry University stay living at home with their parents rather than in halls of residence. ‘They commute from home and have to stay around the campus all day, so they need a place to go in between lectures,’ he says. The Hub itself is a large L-shaped building at the centre of the university campus. Its glazed facade, which the architects describe as wrapping round the building like a taut skin or hard shell, makes it a modern contrast to the ruins of the war-bombed Coventry Cathedral nearby. However, the architects did take some of their inspiration from the cathedral’s stained glass windows to create a ceramic frit for the union’s otherwise smooth glass facade. Inside, the Hub offers a variety of versatile spaces for learning and relaxing as well as facilities that include a doctors’ surgery and an employment agency. There’s also a library and, naturally, a bar. 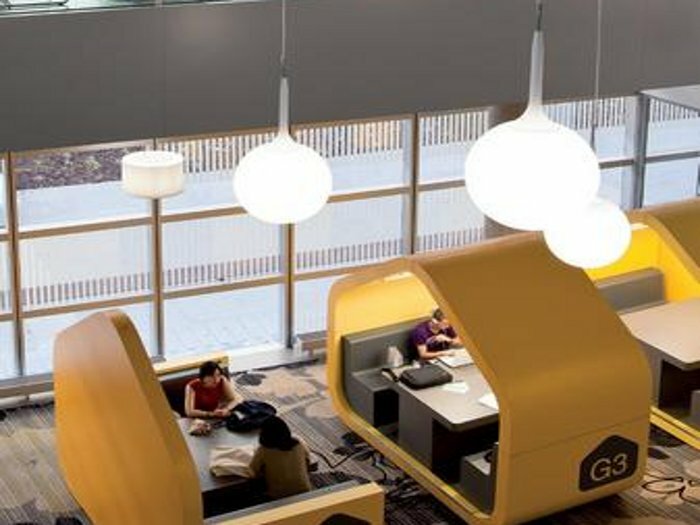 Some 2,800 sq m of space within the building is allocated to informal learning – mostly areas where students can sit down with their laptops – and at first-floor level the space extends along the northern perimeter. This hi-tech, flexible, social and learning environment, open round the clock, can accommodate up to 1,000 people at any one time. Brown says he wanted the interior to have a sophisticated, businesslike feel, something like that of an airport lounge, with huge slabs of exposed concrete, polished resin floors and large, glazed elevations. On the ground floor, modern fluorescent tube lights from Etap are suspended from an exposed concrete ceiling. Acoustic baffles in different colours also hang from the ceiling. They have been placed so that they face in different directions, based on the way people move through the space and so actually help people to find their way around due to the baffles’ colour coding. The lower floor has a ceiling height of nearly 5m and there are certain areas, such as the stairwell, connecting the ground floor with the upper floor where the ceiling is 8.8m high. To mediate between these two ceiling heights, the architects hung teardrop-shaped Artemide Castore-Suspension pendant lights at varying heights. Their white shades and white flexes give them a strong, almost graphic look, especially when viewed against the huge raw concrete supporting pillar that sits at the centre of the stairwell. 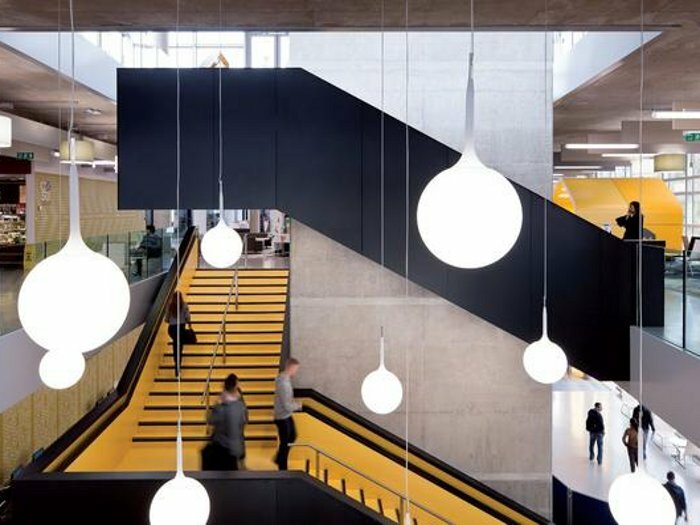 Instead of dividing the vast space into rooms, the designers have used huge modules of furniture in bright yellow or orange to create various zones within the larger space. Ranging from house-shaped seating areas with gable roofs to circular seating ‘nests’ furnished with oversized Fatboy beanbags, all the modules are bespoke and either cast in resin or made of specially laminated plywood. These seating areas have their own power supplies for laptops and are fitted with flat-screen monitors. Each seating module has a number stencilled on its side so that students can book seating areas through a computer system. ‘It’s such a big space that I think you need these over-scaled, almost over-coloured, pieces of furniture to take hold and have an impact,’ says Brown. To soften the look slightly, the designers added some decorative touches including patterned carpets from Ege Carpets and Esedra Polifemo pendant lights with cylindrical shades, both of which make the overall space feel more homely. A ‘drop in’ area near the entrance has a bar where students can also work on their laptops. The wall here has been covered in a vinyl patterned wallpaper by Ascot Signsystems, again chosen as a decorative counterpoint to the hard-edged ‘airport lounge’ feel of the space. Otherwise it’s a simple colour palette. On the bar the designers used a durable laminate made by Pollyray in red, which Martin says is ‘virtually bombproof’. Chairs and tables by Ryan were chosen because they are durable yet stylish. ‘They have a timber seat and have quite a nice tactile quality,’ says Martin.